The symposium is a familiar feature of academic life today: a scholarly gathering where work on a given topic or theme is presented and discussed. While the event may be followed by a dinner and drinks, the consumption of alcohol is in no way essential to the business of the gathering. A round of drinks may be something for participants to look forward to after the hard intellectual work is over, but to arrive at the session inebriated (or to imbibe over the course of the event) would mark a person as unfit or incapacitated for the central activity of the symposium, which requires a clear head and focused attention. At a properly staffed symposium, an obviously inebriated participant might well be escorted discretely to the door or otherwise excluded from the proceedings. Not so in the original symposium, which was a familiar cultural institution in many city states in Classical Greece, with a long afterlife in the Hellenistic period. 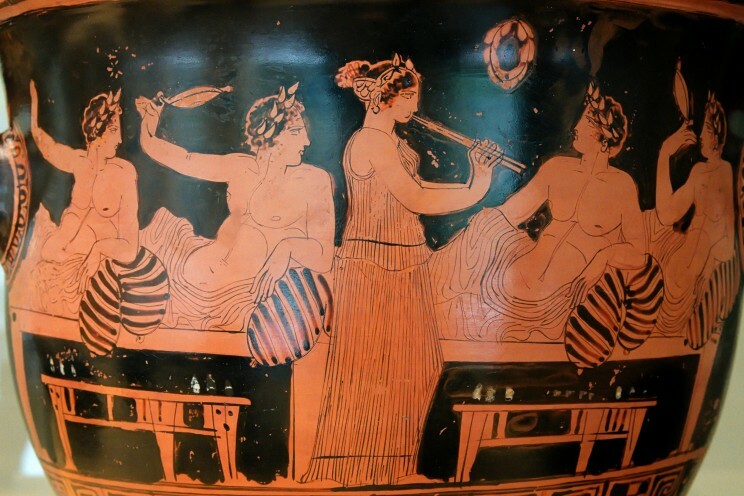 This all-male affair was an after-dinner drinking party (sumposion), in which participants reclining on couches passed around a kratēr of wine mixed with water (drinking unmixed wine was for barbarians). The drinkers sang songs, conversed, and were perhaps entertained by musicians, dancers, and prostitutes. Inebriation was the norm and the conduct often bawdy, but there was at least nominally an order to the proceedings, with one of the participants in charge, and the drinkers having to wait their turn to speak. A very refined version of such a gathering is depicted in Plato’s Symposium, where the participants, hungover from the heavy drinking of the night before, agree to drink more moderately, dismiss the flute girl, and take turns offering speeches in praise of love—although by the end of the night, after the arrival of Alcibiades, the conduct has reverted to the norm, and Socrates has drunk all the other participants under the table. In Xenophon’s Symposium, Socrates offers to dance for the company after the professional entertainers have finished their show. Symposium, by Nikias Painter. CC BY 2.5 via Wikimedia Commons. Two modern descendants of the Greek sumposion preserve very different features of the original institution. The symposium familiar to the modern academic has dispensed with the drinking and aspires to the intellectual refinement proposed in Plato’s Symposium. The Passover Seder (its unlikely cousin) has preserved the ritual drinking, the reclining posture of the participants, and the orderly progression of activities. In the territories conquered by Alexander the Great, which included the land of the Israelites, the sumposion was the epitome of leisured entertainment among the ruling classes, and so became the model for the conduct of a very special occasion. (The more oppressive side of the imposition of Greek cultural norms on the conquered peoples is the background to the Chanukah story). A reader of Plato’s Symposium might suppose that the modern academic symposium adheres more closely to Plato’s aspirations for the sumposion than the Passover seder does. 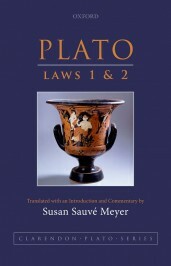 However, Plato’s last dialogue, Laws, indicates quite the contrary. Here we find the Athenian spokesperson defending the sumposion against objections from a Cretan and a Spartan, who live in cities where the institution is banned. It is the drunkenness involved in a sumposion to which these interlocutors object and it is specifically the drunkenness that the Athenian insists is crucial to its function. The sumposion, he explains, is a forum for the transmission and preservation of cultural norms, and the drunkenness of the participants (especially the older ones) plays the important role of “softening them up,” making them receptive to the norms and narratives conveyed in the songs sung and stories told over the evening. A properly conducted sumposion, he claims, educates the ethical and cultural sensibilities of its participants, and cultivates their sense of community. Plato’s proposal is that communal drinking (the literal meaning of sumposion, captured also in the Latin root for ‘convivial’) is an effective facilitator of this important social benefit—provided it is restricted to those over thirty years of age! Featured image: ‘Plato’s Symposium’, by Anselm Feuerbach. Public domain via Wikimedia Commons. Susan Sauvé Meyer is Professor of Philosophy and former Chair of the Department of Philosophy at the University of Pennsylvania. A specialist in Greek and Roman Philosophy of the Classical and Hellenistic periods with special interest in the ethical tradition, her publications include Aristotle on Moral Responsibility (OUP, 2011) and a new volume in the Clarendon Plato Series, Plato: Laws 1 and 2 (OUP, 2015).